WWE wrestler John Cena is a car-nut, and like all car-nuts he’s got to have everything that goes fast, first. And he’s in some hot water with Ford, who’s just sued him for ‘selling his own car’. Yes, Ford is suing Cena for selling his spanking-new 2017 Ford GT supercar at a massive profit. Can’t you even sell the car you own? Well, not if it’s a Ford GT that’s been sold to you through the invite-only route. And of course not when there’s a contract that Ford drew up with the buyers of the 2017 GT, precluding them from selling the car within 2 years. By signing this Order Confirmation Form you are verifying the following: … (B) You understand that being selected for the opportunity to purchase this vehicle is non-transferable and agree not to sell the vehicle within the first 24 months of delivery. It’s just a car. Why does Ford have to do all this? In the supercar world, it’s not uncommon for buyers to flip a newly bought car for a profit. This is how it plays out. When a car is rare (read limited edition or limited production of say just 99 units or so), there are a lot of buyers for it. If someone puts his newly bought, ‘rare’ supercar up for sale, there are more than a few buyers willing to buy it, at a much higher price than the original (manufacturer suggested retail price) price. Manufacturers such as Ferrari, Porsche, Aston Martin, and even Ford (in this case), know about it, and draw up contracts to prevent buyers from profiting from such sales. Supercar makers say that they’re doing this to prevent black-marketers from getting into the ‘hallowed world’ of invite-only cars. They’re also said to do this to tightly control resale values of rare cars. Yes, a lot supercars are collectibles, and unlike regular cars, get pricier as they age. Mr. Cena has unfairly made a large profit from the unauthorized resale flip of the vehicle, and Ford has suffered additional damages and losses, including, but not limited to, loss of brand value, ambassador activity, and customer goodwill due to the improper sale. 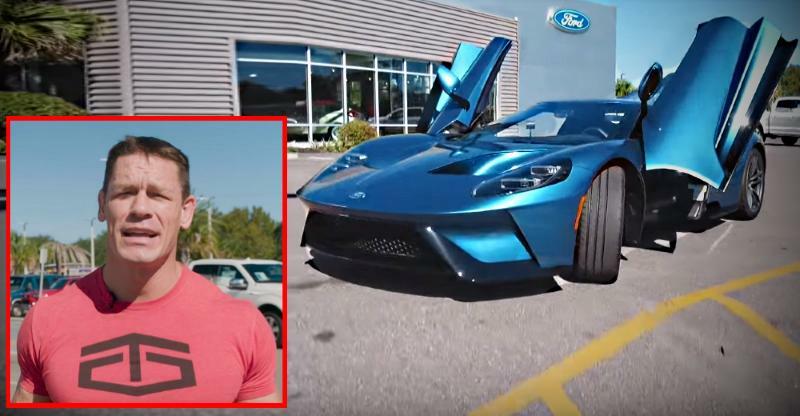 John Cena, who’s an avid car collector, is yet to respond to Ford’s legal notice. Bring out the popcorn. We surely haven’t heard the last of this.